I am super proud of and excited for my nephew who will be competing at the USA Triathlon 2010 Elite National Championships on Saturday in Tuscaloosa, Alabama. Kenny is only 22 years old and just turned Pro this season after competing at the Collegiate Triathlon level for Cal Berkeley (University of California, Berkeley). Since graduating, he has been employed full-time and continues to manage training and local races. In 2008 Kenny competed in Age Group (20-24) Nationals. Last year he competed at World Triathlon Championships in Australia. Saturday, September 25th, Kenny will be competing against 48 other Pro Triathletes (the second youngest Pro in the field). This will be his third Pro race ever - and it is Nationals! This weekend is a really big deal for Kenny. If anyone sees him out on the course (he is 6'4" tall, 154 lbs, with crazy brown surfer hair), please cheer really loud for him, and go up and talk with him after the race. He is very enthusiastic about his sport, a great competitor and a great person. Good Luck Kenny, your entire family and all your friends are cheering you on. 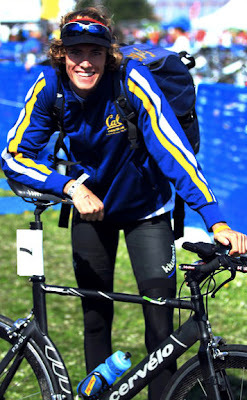 Kenny recently at Triathlon at Alcatraz - his first Pro paycheck race! Live Blog: USA Triathlon will provide race commentary and live results for the age group and elite races on a live blog. Visit the live blog page to follow the action. Versus will be showing a late taped version of the race on television in October: VERSUS televises the 2010 USA Triathlon Elite National Championship on Thursday, Oct. 14, from 4-6 p.m. EDT. Go Kenny Go! You are awesome!